Summary of: Racial Disparities of Juvenile Arrest Records. Raphael, S. & Rozo, S.V. (2019). Journal of Labor Economics vol. 37 no. S1. In juvenile cases, when interacting with youth under the age of 18, police officers have some discretion in how to handle an arrest. Police can treat the matter less seriously, by releasing the suspected youth with a warning. In juvenile cases, this usually means a call or visit to the youth’s parent or guardian. In a more serious handling of the arrest, police can issue a citation, or an order to appear in court. And most seriously, police can book the suspected youth, collecting identifying information including fingerprints, and admitting them to the local detention facility. There is significant variation in the outcome of juvenile arrests. Less than 40% of juvenile arrests lead to a formal booking, just over 40% lead to a citation, and about 20% lead to neither. This variation does not exist in adult arrests; between 70% and 80% of adult arrests lead to a formal booking, just over 20% lead to a citation, and almost none lead to neither. There is a significant racial disparity in the outcomes of juvenile arrests. Black youth are about 50% more likely to be booked following an arrest than white youth, and Hispanic youth are about 18% more likely to be booked. White youth are 40% more likely to be released with a warning than Black youth. This disparity is consistent even for youth who are arrested multiple times. White youth being arrested for the fourth time are fifteen percentage points less likely to be booked than Black youth arrested for the fourth time, and only three percentage points more likely to be arrested than Black youth arrested for the first time. This disparity echoes racial disparities across all aspects of the criminal justice system. For example, African Americans account for 30% of all arrests and a third of individuals on probation or parole, despite representing a much lower proportion of the total population. This racial gap in juvenile bookings is significant because the difference in how an officer treats an arrest can mean the difference in the youth going forward with or without a criminal record. If the outcome of a juvenile arrest affects later criminal justice outcomes, the disparity observed in youth may influence disparities observed downstream. Our study investigates how a history of a booking influences the likelihood of a future booking during arrest, and examines the racial disparity in juvenile booking to determine how much can be attributed to racial bias of the officer. We examined arrest data to understand if being booked as a juvenile increases the likelihood of a formal arrest in future encounters with law enforcement. We used data from the Monthly Arrest and Citation Register, which provides detailed information on all recorded arrests and citations in California. We observed individuals who were arrested at least twice between 1990 and 2013, and whose first arrest occurred when they were either 17 or 18. This allows us to compare the effect of being booked as a juvenile to being booked as an adult. We found that, for suspects arrested for the same two crimes, a suspect is about 12 percentage points more likely to be booked during the second arrest if they had a juvenile booking. What explains the juvenile booking disparity? Controlling for gender, age, the current charge, the number of prior bookings, and the arresting agency (or location) explains about three quarters of the gap in booking rates between Black and white youth. This indicates that about a quarter of the observed racial gap is unexplained by observable differences between the youth being arrested. Our models show two key variables that explain large portions of the Black-white racial gap: the seriousness of the current charge, and the agency conducting the arrest. This Hispanic-white racial gap has a different pattern. Controlling for differences in demographics, current charge, prior arrests, and prior bookings does not explain any of the gap in booking rates between Hispanic and white youth. However, controlling for the arresting agency explains about three quarters of the gap. The significant impact of the arresting agency, in other words the city conducting the arrest, shows the severe implications of residential racial segregation. It means that the agencies that disproportionately arrest Black youth are also the agencies that are most likely to book juveniles for non-violent felony offenses. The majority of racial gaps in booking rates can be explained by observable differences between youth being arrested, but there is still a significant portion (about a quarter) of the racial gap that is unexplained. This unexplained gap could be either the result of racial bias by police officers, or differences between youth that we cannot measure but would lead officers to treat them differently. To understand whether the cause of this unobserved gap is due to bias, we examine the impact of officer discretion on racial gaps in bookings. Racial disparities in booking rates are highest for offense categories where police officers have significant discretion in how to handle the arrest, like non-violent felonies. In addition, in comparing booking rates for juveniles and adults, white youth have the largest increase in bookings after age 18, narrowing the racial gap for those over 18. Again, the biggest changes are in offense categories with high levels of discretion, like property and drug felonies. These two observations indicate that, when police officers have more discretion in how to handle arrests, racial disparities are more likely to arise. This is strong evidence that racial gaps in booking rates can be explained by differential treatment by police officers of youth of different races. Given the clear and significant racial gaps in juvenile bookings, it is important to consider how the treatment of a juvenile arrest may permanently impact life prospects of the youth. Criminal records are becoming an increasingly important factor in later in life outcomes. Police officers use criminal history in decision making during law enforcement interactions. Risk assessment for criminal justice decision-making in matters like pre-trial release and bail setting also relies on factors like prior arrests. Even employers are increasingly using a criminal record in employment decision-making. By disproportionately giving youth of color a criminal record, police handling of juvenile arrests is magnifying the racial gaps observed later in life. For youth born between 1990 and 1993, 34% of Black youth had at least one booked juvenile arrest, 13% of Hispanic youth, and 8% of white youth. 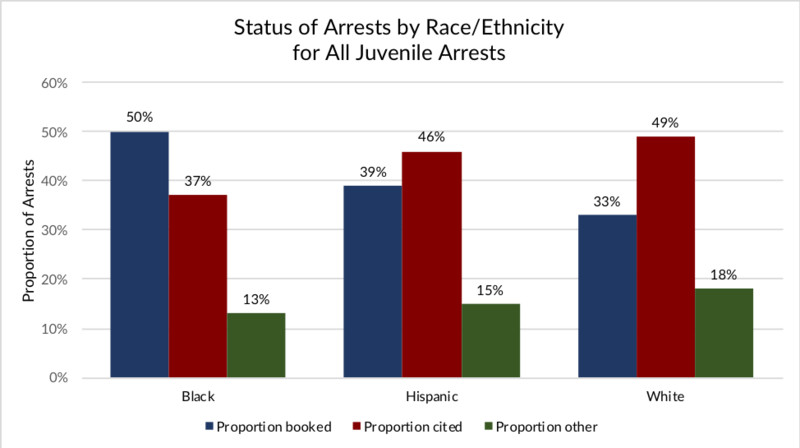 If Black youth were booked at the same rates as white youth, the proportion with a juvenile arrest history would drop to 24%, eliminating half the gap between Black and white youth.